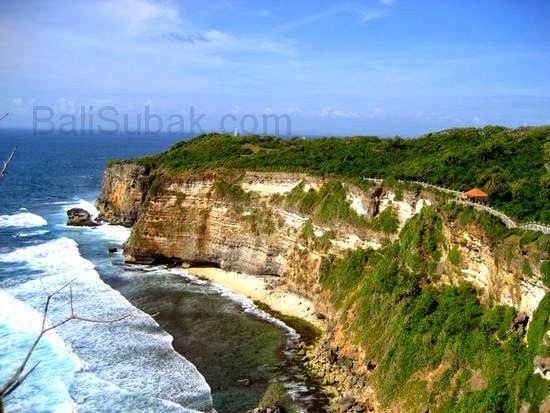 Uluwatu is a very famous attractions and most sought after by tourists who are in Bali. When people hear about attractions Uluwatu in Bali, then people would imagine a cluster of high cliffs and seas are very vast. Regions of high cliffs of Uluwatu is a cluster of very long stretching from west to east. At the base of the cliff there is a beach with white sand, but it is rarely seen because it is often covered by ocean tides. Cluster cliff snaking with green trees grow on cliffs. This area is a forest inhabited by long-tailed monkeys. When standing on the edge of a cliff overlooking the sea, on a cliff without a safety, then the tension will be felt. Especially when the wind blows hard, and it hit the body when standing on the edge of high cliffs and steep, fear inevitably arises. The fear of heights, as this body will fall to the bottom on the high seas. If people are suicidal in Uluwatu, it is certain he will die instantly. And certainly his body was hard to find. Therefore, Uluwatu area guarded by a very tight, so that no one is put through actions that threaten the safety. Cluster of steep cliffs at Uluwatu looks very beautiful and attractive. If you visit this attraction, do not forget to bring a camera. Take a picture of yourself with the background of cliffs and blue seas. Do not forget to invite your lover, because this place is very romantic to be explored. When you visit Uluwatu attractions, time to yourself you wait until late afternoon. Because during the afternoon very beautiful sunset views. D west temple, there Kecak performances, which welcomes the sunset. Kecak performances routinely performed. Kecak performances is usually done late in the afternoon when the sun will set in the west. Contour beautiful cliff, at the bottom of the ocean waves that constantly looks to hit the cliff. Natural wonders are difficult to express in words. 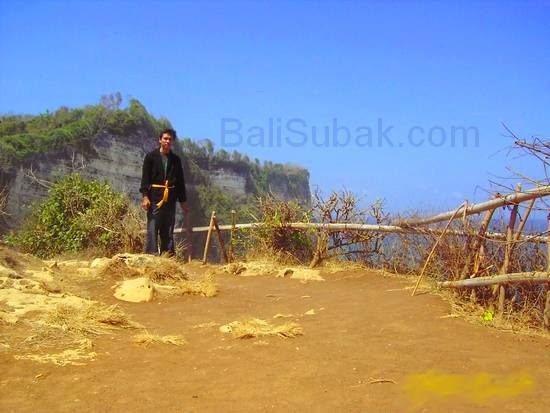 At that occurred in Bali in the past, thus forming a cluster of beautiful cliff into a tourist attraction. Anyone who saw these cliffs will surely be amazed and astonished. The natural beauty of God's creation. The island of Bali is a small island, Uluwatu attractions make a tourist attraction in Bali is very complete. Whatever you want to find in Bali tourists, especially nature tourism, all there is in Bali. From the high mountain, up to the sea with beautiful coral reefs, all can be found in Bali. To reach all the beautiful places in Bali can be traveled only by a few hours. Close, easy, cheap, and beautiful. Uluwatu attractions has recorded the highest number of tourist arrivals in the early 2014's. This attraction is the most sought after tourist. Natural feel calm with a cluster of high cliffs and steep is the uniqueness that is hard to find elsewhere. Balinese people believe in miracles. Tourist attraction in Uluwatu, derived from the temple located there. The temple is named Pura Uluwatu. Balinese people are very confident, radiant energy from the temple made ​​of natural surroundings to be very comfortable and soothing. The temple existed before the famous of Bali. Temple is very old and made ​​of high tip and steep cliffs. Blog is very informative for the readers. Shared information about Bali is outstanding and the shared images are marvelous. I have visited Bali a year ago before my boston to Philadelphia tour. I had a great experience there by enjoying a Pura Luhur Uluwatu temple. Bali is a land of landscape, mountain, sandy beaches, historical places etc.It is best known for the countless temples. Nice sharing friend! Uluwatu is a beautiful attraction in Bali. You images are also present that it is a beautiful creation of God. I like to go in different places around the world. Your blog is very informative for me. I’m recently come back boston new york washington tour with my wife. It is a best tour in my life but after see you blog I think this visit is the best for me for all tours. Thanks for this sharing.